Hallein is a town with a population of approximately 20,000. It is Salzburg′s second city and through its salt mines in Mount Dürrnberg, it was also the main source of the state′s wealth ever since the Middle Ages. 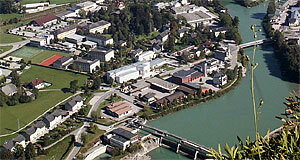 Today, Hallein is still economically significant, even though the mining has ceased. It is wood and other industries that have led to a strong influx of immigrants. This gave Hallein the nickname "Little Istanbul"; despite of its economic importance, Hallein has remained a significant travel destination. This is largely due to day-trips from the city of Salzburg: The salt mines (now extremely well-developed show mines), the Celtic museum (Keltenmuseum) and the city centre make Hallein very popular even among international tourists. The salt mines have been covered in a separate article (see link above), this one deals explicitly with Hallein as a city. Hallein is a county town, more specifically the capital of the Tennengau area. It is well-connected to Salzburg via a motorway, trains and other public means of transport. During the summer, you can also cycle from Salzburg to Hallein along the Salzach river, a very rewarding and relaxing trip. If doing so, note the Pernerinsel, a semi-artificial island on the Salzach where you can find an event venue used for concerts and - during the summer - for the Salzburg Festival. The town centre of Hallein is known for its Baroque architecture. It is divided into the area of the lower and upper market region. Despite of a few run-down and somewhat shabby buildings, recent years saw attempts to re-vive the old town. Whether they have succeeded remains to be seen. From Hallein, you can go hiking - for example, starting from the Dürrnberg or taking a cable car called Zinkenbahn. Another major attraction of Hallein is the brewery of Kaltenhausen, which has a beautiful beer garden. It is the oldest brewery of Salzburg and even though it is now part of a consortium of breweries and makes mostly unexciting beers, there are still a few gourmet beers available at Kaltenhausen itself. Try for example the Bernstein, which is a mild, malty beer with an amber colour. Note that Hallein and with the salt mines and the Keltenmuseum makes a good destination for a rainy day.